Should Clinicians Be More (or Less) Politically Active? Politics and healthcare are occupying much of the news cycle this summer with all of the discussions around the possible repeal of the Affordable Care Act (AKA Obamacare). On one hand it can viewed as must-see reality TV with all of the drama and back and forth arguments with passionate opposition. Late-night TV hosts help turn the drama into satire and give everyone a good laugh and some entertainment. Yet it is important to see that this will greatly impact the care of the patients we see every day. To be honest, it was not until a few years ago that I started to see the power of getting more politically involved as a physician. . I thought that dutifully voting was doing my part as a citizen. Nowhere in my education was it ever modeled for me that I should use my training and experience as a doctor to help influence public policy. Talking to legislators? I don’t have enough time. I’m a busy doctor. Emailing legislators? They probably hear from other people. Reading up on the pros and cons of new legislation and how it may impact me as physician? That is why I pay dues to professional societies and their lobbyists. A few years ago, I got the chance to go to a Hill Day with the American Academy of Hospice and Palliative Medicine. The morning started off great with legislators and their staffers coming to tell us about the importance of the public voice in a thriving democracy. It was just like being back in High School in American History class with Mr. Horvath! We were given our assignments for the afternoon to walk around Capitol Hill and meet our Representatives and Senators and tell them why we supported the Palliative Care and Hospice Education and Training Act (PCHETA). Despite speaking on the merits of hospice and palliative care to thousands of people over the years, this setup for a small meeting with political leaders was intimidating. As legislators, they seemed distant and removed from my everyday life, but yet they were critically important to the function of government. Reflecting back on the passage of the Medicare Hospice Benefit, I tried to muster up the courage of those empowered volunteers of the early 1980’s. 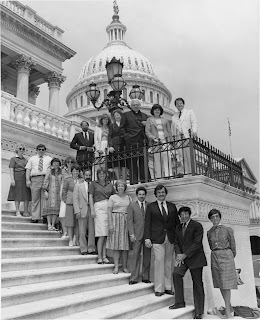 Many of us would not have careers if they had not knocked on Senators doors and told the story of people at the end of life. Sitting in Senator Roberts office, I waited with my advocacy team. We struck up a conversation with the other people waiting to visit the Senator. They were from the United Motorcoach Association and mentioned in the course of our small talk they had been here before. I was bewildered. What important policy issues could the United Motorcoach Association have to talk about? Were they more important than the care of hospice and palliative care patients? But then it hit me. They have every right to be here, to advocate for their interests, to represent their story. And if they were here telling their story and I didn’t show up today, Senator Roberts would have no knowledge of what I care deeply about. If we don’t show up and tell our story, then no one is going to care enough to reach out to us to find out more information and therefore other policy priorities will be advanced long before ours. 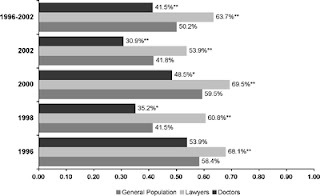 So knowing that physicians vote less often than the general population (and even less often than lawyers), how politically involved should we get on behalf of our profession and more importantly on behalf of our patients? This will be the topic of the July 2017 #hpm Tweetchat too so if you want to join the conversation, get on Twitter at 9p ET on July 26th. You can also add your comments below. 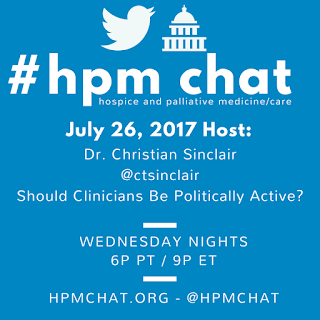 Christian Sinclair (@ctsinclair) is a palliative care doctor at the University of Kansas Health System, and immediate past president of the American Academy of Hospice and Palliative Medicine. He writes for Pallimed when he doesn't have other deadlines impending.